In 1958, Malaco, a Swedish confectionery manufacturer, decided to expand its business by exporting a few of their products to North America. The Malaco exporting business grew and in late 1960's and early 1970's Swedish Fish and Swedish Berries were developed specifically for the North American market. 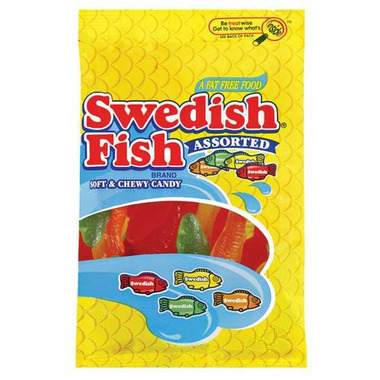 As you have probably already guessed, it was named Swedish Fish because it was developed in Sweden. Today Swedish Fish are made made in both Sweden and Canada and owned by the Cadbury Adams Company. This is my favorite treat! Perfect at home or on the run, They are slowly getting harder to find, that's why i love that they are well.ca. They were perfect to grab just before valentine day :) The red and green ones are my favorite. Yum! Love this treat! Best price too! it is so hard to find these anymore! They are perfect for my rice crispy sushi treats! I bought them for my partner and he just devoured them! The little boy that I gave them to, ripped them open and were in his mouth before he opened his other gift. They were number 1 on his list. My only disappointment was that he would not share. Have loved these for year. YUMMY YUMMY! Soft and fresh both times I have purchaseed them from here so far. yummy - didn't make it far past my friends before they were consumed! DELICIOUS AND SO SO FRESH! Like Jason, I also bought these on an impulse (for a friend). She loved them and said they were delicious! Who doesn't like these tasty fish!? Red fish, green fish, yellow fish... yummy fish. This was a great impulse buy for my sweet tooth. I wish they still sold packets of just the red swedish fish. Not really a fan of the other flavours. The product was fresh and good. I was also very pleased with the quick shipping I received. Will be buying from this site again. Many thanks! I grew up with these as a young child. They are still by far my favourite candy.